1. O(P) has the same functionality as P.
2. O(P) protects any secrets that may be stored inside and used by the program. 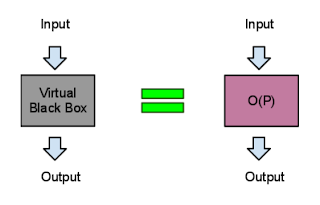 The obfuscated program should behave like a virtual black box; anything that can be computed from O(P) should be able to be computed by giving oracle access to the program P.
I prefer to have provable security for small classes of programs instead of having obfuscation techniques for many classes with weaker security. The only positive result that I am aware of is that a point function can be provably securely obfuscated under the random oracle model [1,3]. It takes as input the password and outputs true/false. More formally, a point function is a Boolean function that takes the value 1 (true) at exactly one point. Lynn et. al. 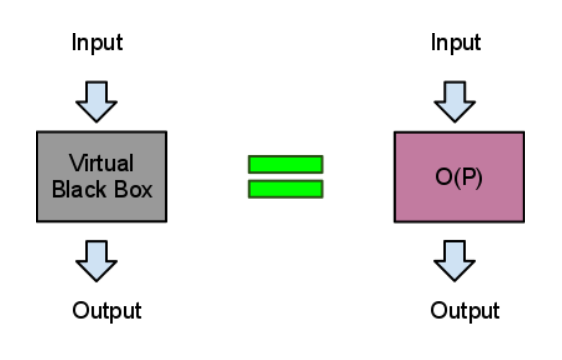 extends the above idea to construct provable obfuscation techniques to do more complex access control functionalities. Those who are interested in specific construction techniques are encouraged to read  and . I like this blog is fantastic, is really good written. This is very good article on Provable Obfuscation. I understand the concept well with your post. The diagram gives you basic idea of Obfuscation. I really like your work. This is an important topic and I believe it’s useful also.